A premium starter kit for those who are always on the go or those who want to stand against the status quo of giant mods and huge e cigarettes! The iCare Mini is one of the smallest devices on the market. It has a battery life of 320mAh but comes with its own portable charger case. The PCC acts like the iCare Mini’s own personal power bank with a 2300 milliamp capacity. Both the device and the PCC can be recharged using the USB Charging Cord. In fact the iCare Mini has a passthru function that allows you to vape and charge at the same time. 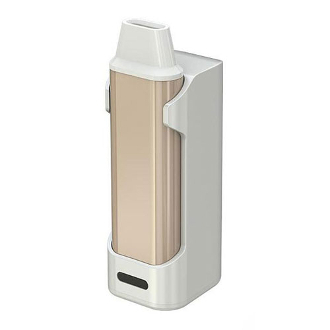 The iCare Mini has an internal tank and air flow system. To access it, simply pop off the top cap. Once the cap is off, pull out the silver piece sticking out. As you pull it out and you will begin to see a long silver cylinder. This silver cylinder contains your airflow control and your coil at the bottom of it. The iCare Mini is able to switch and replace coils to refresh the flavor and vape quality. The place where the cylinder once sat it is your eliquid area. It can hold an approximate 1.3mls and has a max fill line located on the front of the e liquid window. Just like its predecessor the “iCare” this device will read out your battery life through led coloring: Green, Yellow, and Red. Green indicates that your device is ready to go with a battery percentage between 100-16%, the yellow means your device is slowing down with a battery life of 15-6%, while red lets you know that your e cigarette is on its last legs with a percentage less than 5%.